Everytime I hear our president speak, I think about Karl Marx's 18th Brumaire: "Hegel remarks somewhere that all great, world-historical facts and personages occur, as it were, twice. He has forgotten to add: the first time as tragedy, the second as farce." Marx was talking about the return of a Bonaparte to power in 1848, but his book is as accurate an assessment of the second Bush presidency as one can find. Read it and be very frightened. Yet I remain bullish on our Republic. How can I be so optimistic? Because we have Tocqueville on our side. Alexis de Tocqueville shares with Karl Marx the distinction of being the nineteenth-century's most insightful critic of modernity. This doesn't mean that Tocqueville disliked modernity; on the contrary, he approved of much of it and spent a great deal of energy demonstrating to all who would listen that, for the most part, modernity was a blessing. Modernity, according to Tocqueville, propagated liberty and made possible certain values and institutions that could protect that liberty from other attributes of modernity that threatened to destroy it. Besides, Tocqueville was convinced that modernity was going to happen no matter what one thought about it. For him, the choice was not between modernity and some non-modernity but between good modernity and bad, between liberty and terror, and between democracy and tyranny. Tocqueville himself was confident that modernity could work just fine. His proof was America. At the heart of Toqueville's views lay a teleology of historical progress, a narrative (post-modernists would say "myth") of modernity. Looking backward into the past, Tocqueville perceived, working beneath the surface like shifting soils and tectonic movements the progression of two forces: democratization and centralization. 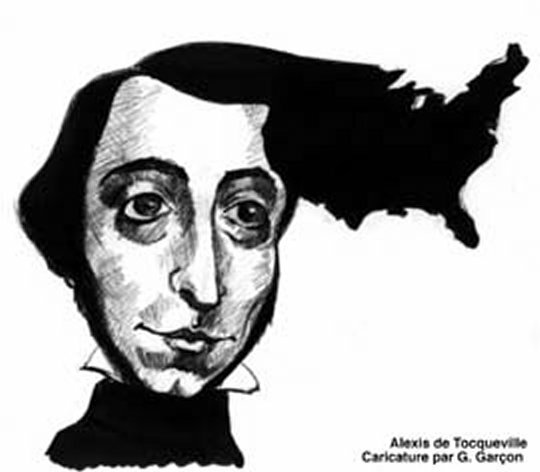 Using France as his archetype, Tocqueville argued that the state's progressive appropriation of power, beginning long before the Revolution, actually promoted civil equality and de facto democratization by eroding the privileges and disabilities of feudal society and placing individuals in an unmediated relationship to the state. In taking this view, Toqueville was in perfect agreement with contemporary conservatives, who fret that centralized government tends to lessen the privileges of the outrageously rich. According to Tocqueville, the process of democracy and liberalization had all the earmarks of something that transcended history. "The gradual development of the equality of conditions," he wrote, using his term for the post-feudal, democratized society, "is thus a providential fact and has all the corresponding characteristics: it is universal, it is durable, it escapes every day human power; all events, like all men, serve its development." Whatever the merits of "providence" (I would refrain from speculating as to whether or not the processes that Tocqueville identifies with modernity are either universal or providential. In fact, the possibility that he's wrong on both counts should make us appreciate the contingency of the modernity he describes; it may only be possible given a particular set of circumstances. ), Toqueville's historiography, at least in the West, is correct. Of course, the historical processes he describes sometimes take centuries to unfold, as in America's own treatment of minorities, a work still in progress. But they are the reason why to paraphrase a certain baseball player, modernity has been very, very good to us. By us I mean Jews.